"Where there is appreciation, there is courtesy, there is concern for the rights and property of others. Without appreciation, there is arrogance and evil. "Where there is gratitude, there is humility, as opposed to pride. "Cultivate a spirit of thanksgiving for the blessing of life and for the marvelous gifts and privileges each of us enjoy. The Lord has said that the meek shall inherit the earth. (See Matt. 5:5.) I cannot escape the interpretation that meekness implies a spirit of gratitude as opposed to an attitude of self-sufficiency, an acknowledgment of a greater power beyond oneself, a recognition of God, and an acceptance of his commandments. This is the beginning of wisdom. Walk with gratitude before him who is the giver of life and every good gift." There is so often a contrast between society at large, and those who strive to follow the Lord's way. 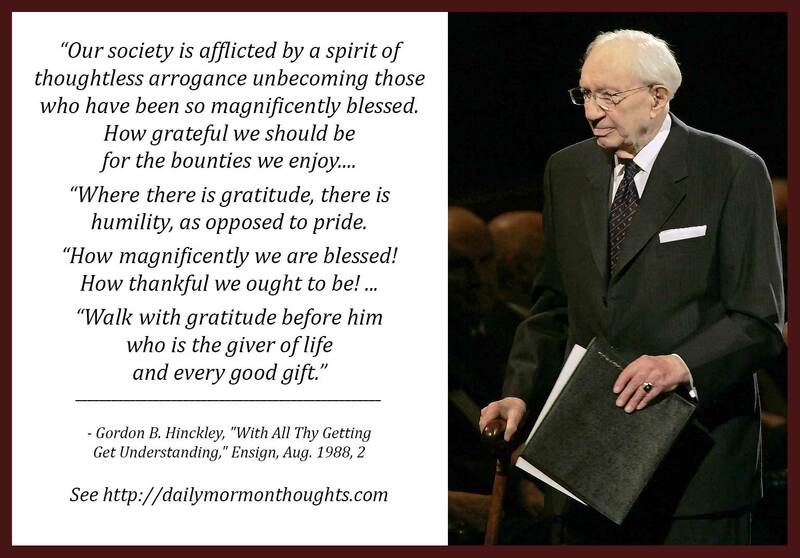 President Hinckley identifies one important root case of that contrast: the "spirit of thoughtless arrogance" that comes when we fail to acknowledge the source of our blessings in life. 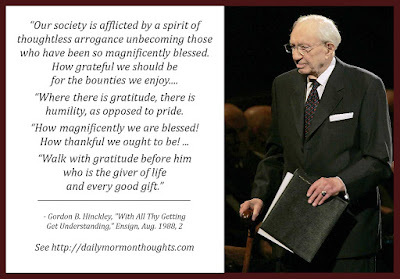 When we fail to recognize how "magnificently" we are blessed by God, thinking that we are self-sufficient and not dependent on God, we develop instead arrogance, ugly egotism, and pride. 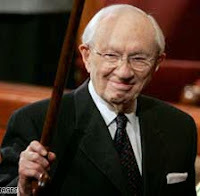 President Hinckley's warning and counsel is to "walk with gratitude" before God in all we do!